Born in a professional Tabla maker family at Miraj (India), Haridas Ramchandra Vhatkar is the third generation of excellence following the footsteps of his grandfather Kerappa Ramchandra Vhatkar and father Ramchandra Kerappa Vhatkar. 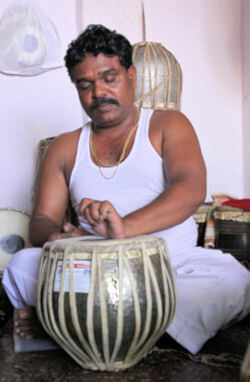 Haridas began learning the art of Tabla making with dedication at an early age. Soon, he realized that he had within himself a relentless hunger for learning, innovation and perfection. He then began to constantly push the envelope of his knowledge and thoughts further through experimentation and research. 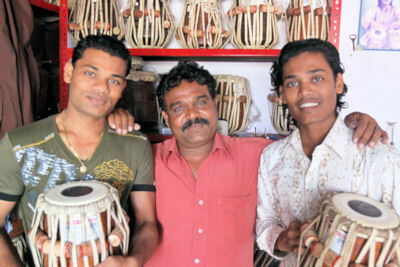 Learning through success as well as failures, Haridas decided to come to Mumbai in pursuit of his dream ...... To make Tabla for Tabla Maestro Ustad Zakir Hussain !!! 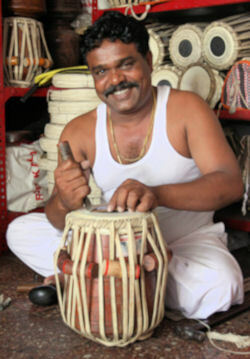 Haridas came to Mumbai in 1994 and started working as a Tabla maker for the famous Haribhau Vishwanath Musicals. He received a lot of support and encouragement for his work and experimental efforts from Shri. Dilip Diwane. Soon, his talent began to get noticed by many of the stalwarts in the field of Tabla. 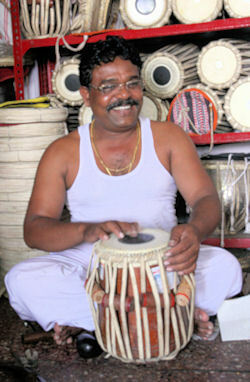 Haridas started his own Tabla shop in 1998. Impressed by the par excellence work of Haridas, Shri. Yogesh Samsi showed one of the Tablas made by Haridas to Abbaji. Abbaji appreciated the extraordinary talent of Haridas and recommended his work to Ustad Zakir Hussain. Impressed by the exceptional talent and amazing craftsmanship, Ustadji immediately asked Haridas to make a Tabla for him ............ and that was the moment when Haridas's long cherished dream came true !!!. Ever since, Haridas has received Ustadji's blessings in the form of immensely valuable guidance, intricate thoughts and valued tips about the instrument in all aspects of it. Also, Ustadji recommended Haridas's work to many stalwarts who appreciated the work and asked him to make Tabla for them. Haridas feels extremely honored been blessed by the likes of Pandit Kishan Maharaj, Pandit Arvind Mulgaonkar, Pandit Anindo Chatterjee, Pandit Suresh Talwalkar, Ustad Shafaat Ahmed Khan, Pandit Divyang Vakil, Pandit Nayan Ghosh for their valuable guidance, support, appreciation and encouragement. He is also honored being associated with the likes of Fazal Qureshi, Shri. Vijay Ghate, Anuradha Pal, Taufiq Qureshi, Trilok Gurtu, Pandit Durgaprasad Mujumdar, Sivamani, Talvin Singh. Haridas' relentless journey in the search of knowledge and perfection still continues. It is his mission to take his art all around the world through collaborated efforts. Also, he is committed towards passing on his art to the next generation. Today, the fourth generation into the profession promises to bring even greater glory to the family. His sons Kishore and Manoj are keenly and dedicatedly mastering the art of Tabla making from Haridas, and are already receiving a lot of appreciation from many stalwarts. Haridas hopes that their talent exceeds that of him and reaches untouched heights in all aspects of the art of Tabla making.